There was a time when the pines grew tall, straight, and plentiful in the area now known as Piney Woods in south-central Mississippi, a time when lumbermen harvested the land for the longleaf pines valued for their decay resistent wood. The Piney Woods Region has long been a valuable source of wood products, beginning in the 1700s when the French, British, and Spanish searched for tall, straight trunks from which to fashion masts, decking, and framing for their naval construction. Turpentine, tar, and resin were also derived from these valuable stands. In fact, once the forests had been over-harvested in the northeast, the English crown went so far as to reserve plots of land in the south to supply masts for British ships. Cutting the trees was easy compared to the task of moving them to where they could be milled. Early on, the freshly-cut trees were converted to usable lumber and by-products not far from where they were harvested. As time went by, lumber mills started springing up along the rivers of the area so that logs could be floated in. But the problem remained, how to move the heavy trunks to the river and later to the rail lines that had been run into the forests. John Lindsey was one of many lumbermen around Sandersville, Mississippi in the 1890s. In order to move logs to his sawmill [the Lindsey Lumber Company], he tried many types of transportation. He had a wood-rail Shay locomotive to bring the logs from some gathering points to the mill, but the problem was how to get the logs from where they were cut to the gathering points. The conventional method, at that time, was to drag the logs with teams of mules, horses, or oxen, put the logs on a farm wagon (four relatively large wheels with small rims), or run the rail line to every point where the logs were cut. John’s problem was exacerbated by the fact that a great deal of the ground in south Mississippi is very soggy most of the year. Rolling is not a term usually used to describe the landscape around Sandersville and Laurel; mostly flat would be a more apt description. Couple this with heavy rainfall and poor drainage, and you have a recipe for problems moving heavy loads off road. 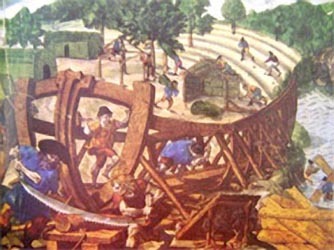 Prior to the invention of the Lindsey Wagon, logs were moved using a variety of small wagons and skids. One of these wagons, called the Caralog (left), was invented by a slave from Pearlington, Mississippi, and greatly improved the woodsman’s lot. Necessity is the mother of invention, so John invented two methods of gathering his logs—the Eight Wheel Log Wagon and the Self-Loading Skidder. As is almost the case, the inventive mind did not come up with the ideal solution immediately. 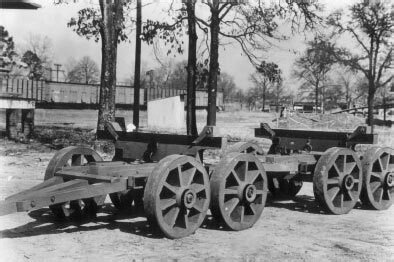 The earliest photo of the Lindsey 8-Wheel wagon shows it with wheels made of solid wood. 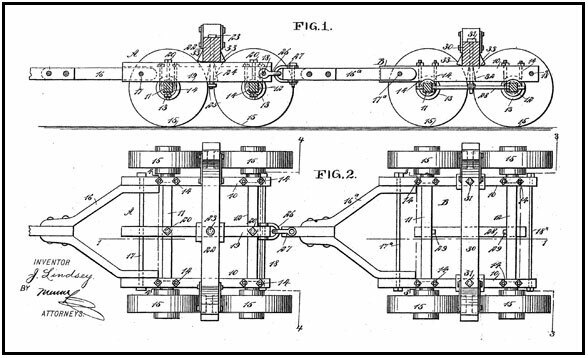 The design of the wagon was formalized when John Lindsey was issued U.S. Patent No. 617,172 dated January 3, 1899. When the sawmill and wagon works burned in 1900, it was decided to rebuild in nearby Laurel. It took the efforts of John’s younger brother, Dr. S. W. Lindsey, to transform the patent into a product that was saleable. Dr. Lindsey designed a manufacturing process and factory that brought raw materials in one end and a finished product (the Lindsey Wagon) would emerge from the other end. According to reports from the time, this was the first manufacturing plant in Mississippi that was fully self-contained. In order to maintain a steady and reliable source of forged metal parts for the construction of the Lindsey Wagon, the Lindsey brothers bankrolled the creation of the Laurel Machine and Foundry Company in 1904. This company was later purchased by the Mulloy family of Laurel in 1912. 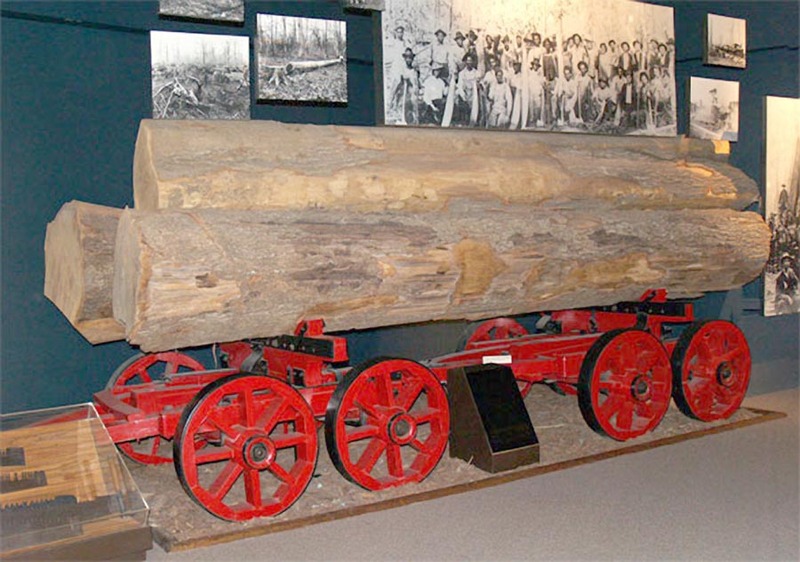 Because the new wagon was able to move heavy loads over soft and unimproved ground, it became very successful throughout the Southern logging region. This postcard (left) mailed in 1907 shows the immense size of the load a Lindsey Wagon could move. During World War I, the U.S. Government had a demand for a wagon that would haul heavy loads in poor conditions. To supply wood for bunkers and trenches, the U.S. Army relied heavily on the Lindsey Wagon. The Company received a commendation for its contribution to the war effort. During the period between the World Wars, the Company exported its products to Central America, Belize in particular. With an office in Belize, it was marketed throughout Central America. Note the similarities between 1900 South Mississippi and Central America in the 1930s—both had unimproved transportation systems and both had poor land for off road movement. This market was important not only to the Company, but also to the U.S. Government because the mahogany wood used to make PT boats (among other things) was harvested in Central America and transported to gathering spots by the Lindsey 8-Wheel Log Wagon. Another postcard showing the 8-wheel wagon with a note that reads "Dear Mother, this is a typical Laurel scene – only I often see them with 8 oxen. Sat[urday] we expect to go out and see the wagon factory where these log wagons are made." It’s interesting to note that a technology developed with the sole purpose of easing the labor of the woodsman working deep within the Piney Woods of south Mississippi would find its way into the annals of world history by contributing to victory for the Allies in two World Wars. After World War II, the demand for the Lindsey Log wagon declined as new technology allowed other vehicles to do the same job faster and more efficiently. The company ceased manufacturing wagons after the death of Sam Lindsey, Sr. (president) in 1950. There are preserved examples of the wagon at the Mississippi Agricultural Museum (above) in Jackson, Mississippi, and in Laurel, Mississippi.